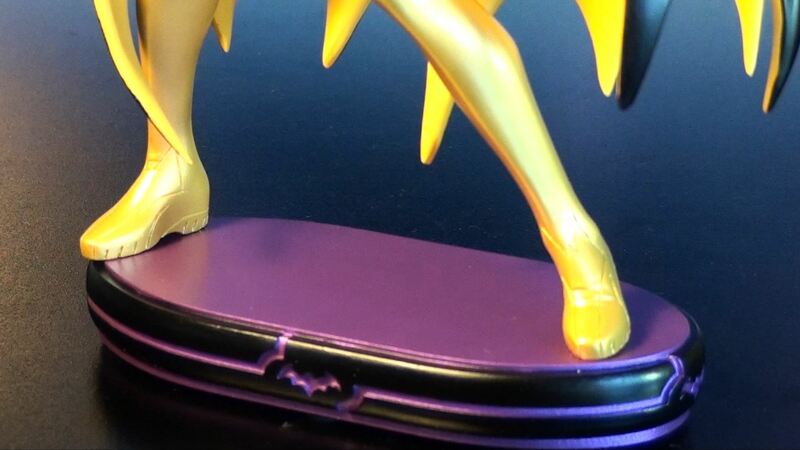 DC Collectibles Cover Girls of the DCU Statue series continues with the New 52 version of Batgirl. Made of high quality resin, this statue scales 10 inches tall, and is beautifully sculpted. 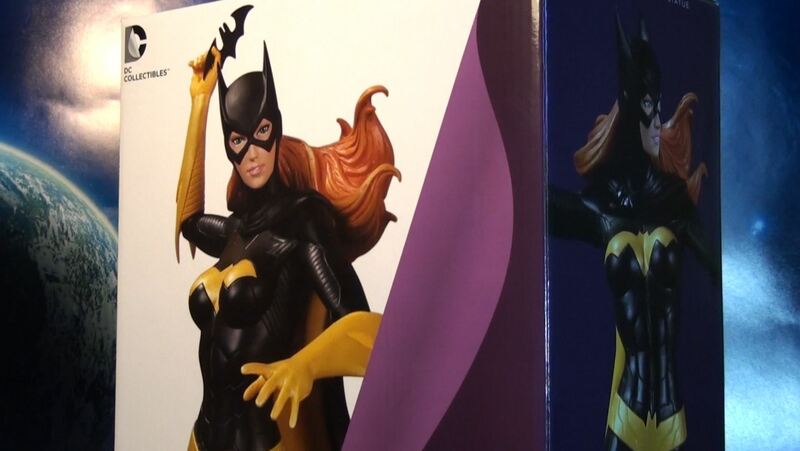 Batgirl is based off the artwork of Stanley Artgerm Lau and is sculpted by Jack Matthews. Includes preattached batarang and an attachable display base. Limited to 5,200. Sells for about $100 (DCcomics.com, amazon). 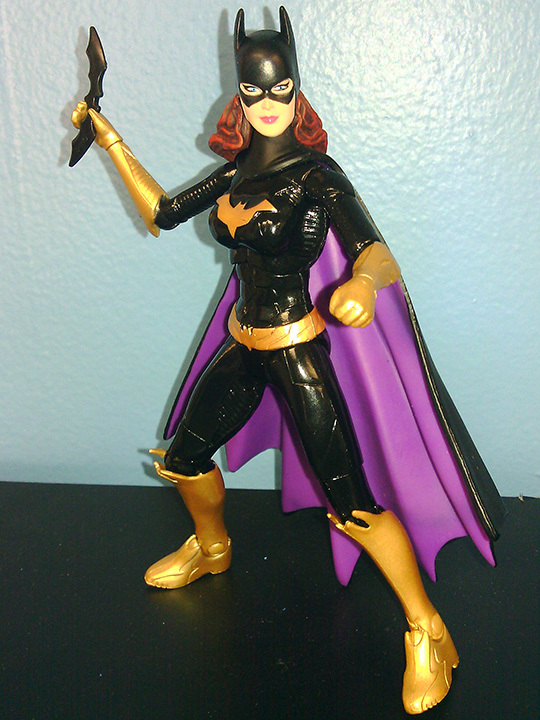 Got my hands on a loose Batman Unlimited Batgirl action figure by Mattel. Found it loose on eBay and I was quick to buy it even though she was out of packaging and had no accessories. I’m huge Batgirl fan and paid more than I should of. 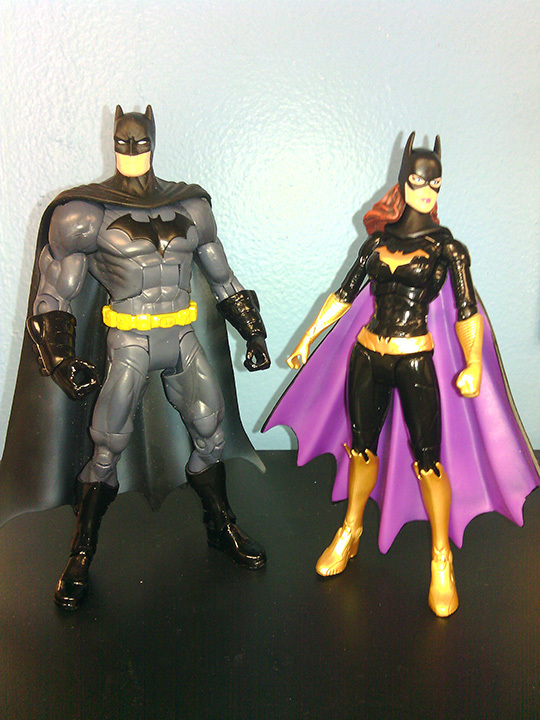 She stands same scale as the 6″ Batman Legacy Batgirl figure (see photo below). She sports entirely new body sculpt except for the head which is a re-used mold. She has high-gloss black body suit with slick gold colored belt, gloves, and boots. Notice the high detail sculpted armor throughout the whole body. Her cowl and backside of her cape are flat black. Inside cape is a bright purple. Articulation has changed this time around. You will notice there is no bicep swivel this time around. This is a disappoint because you can’t get good range for dynamic arm poses. She has ball hinged elbows that allow for 360 rotation and a 90 degree bend. A nice plus this time around is 360 swiveling wrists. 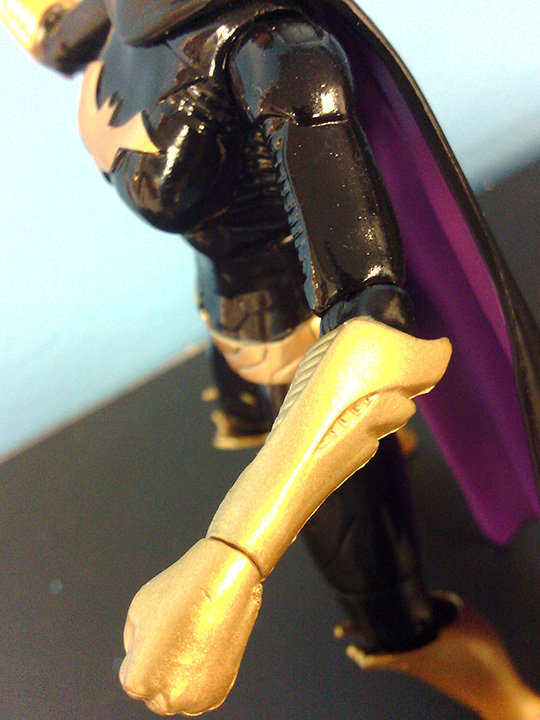 Right hand is open for holding accessories such as a batarang while the left hand is a closed fist. 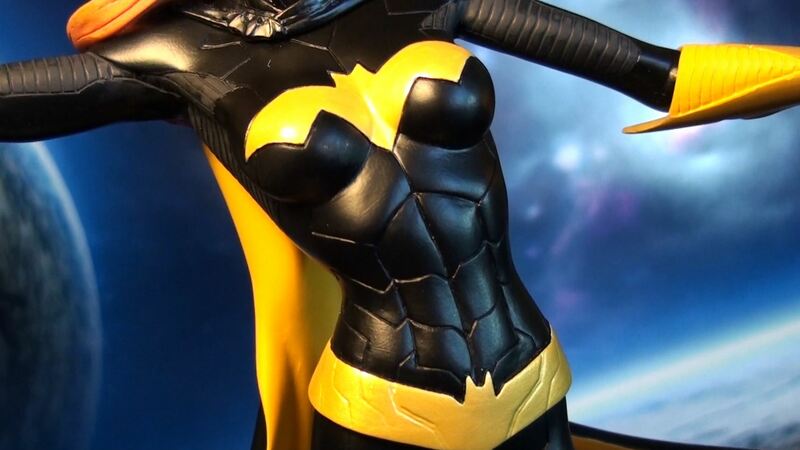 She can barely rotate just above the abs but not with a lot of range due to the sculpt’s design. No waist articulation in the belt area which is surprising. 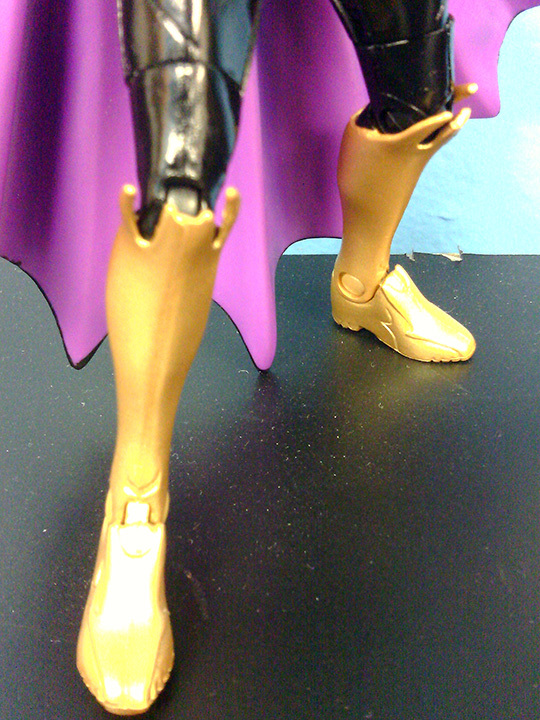 You have new better looking thigh-high articulation for the legs which makes for a better visual look. 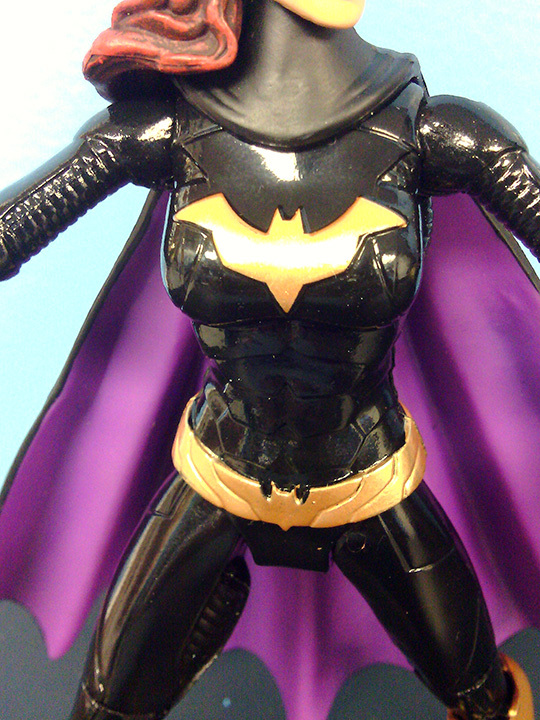 Its similar to the Mattel’s Catwoman figure from the Arkham City video game. Everything else is the same from her Batman Legacy edition: ball jointed head, lower leg thigh swivel just above the knees, ball hinge arms with good range of motion, single jointed knees with a max bend of 90 degrees, and hinge feet. As a nice extra touch, you have peg holes under her feet, perfect if you have an extra stand not being used in your action figure collection. 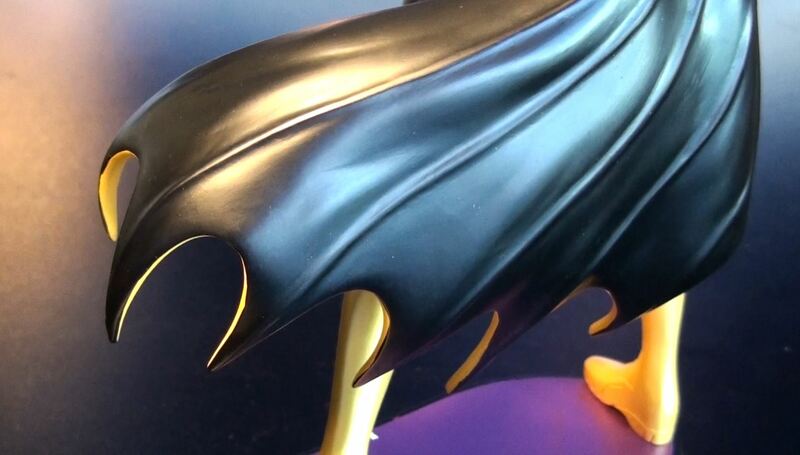 Head sculpt is a reused mold that was used in Mattel’s DC Superheroes and Batman Legacy lines. It’s a very good mold and I’m kinda glad to see it with this figure. The strong red lipstick is a nice touch. 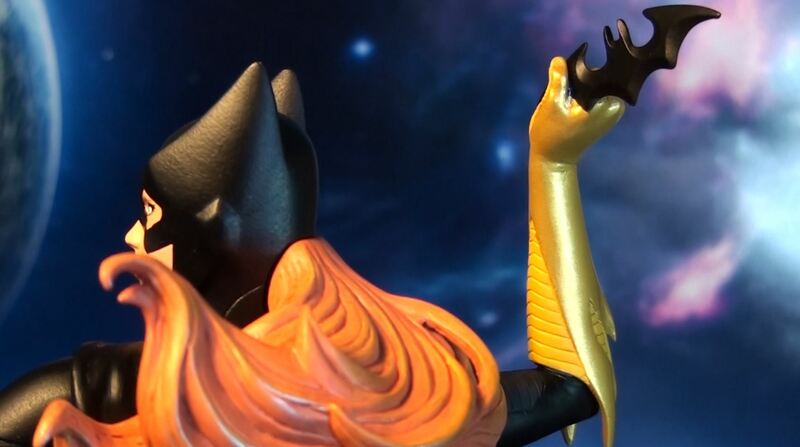 Slick new body mold with some impressive sculpted elements and shiny black and gold colors. Knees are single jointed with a max bend of 90 degrees. Could use more range. Standing with Mattel’s DC New 52 Batman. Good scale against Batman. Other things to note: The thigh joints are very loose so dynamic posing like a fighting stance can be difficult. 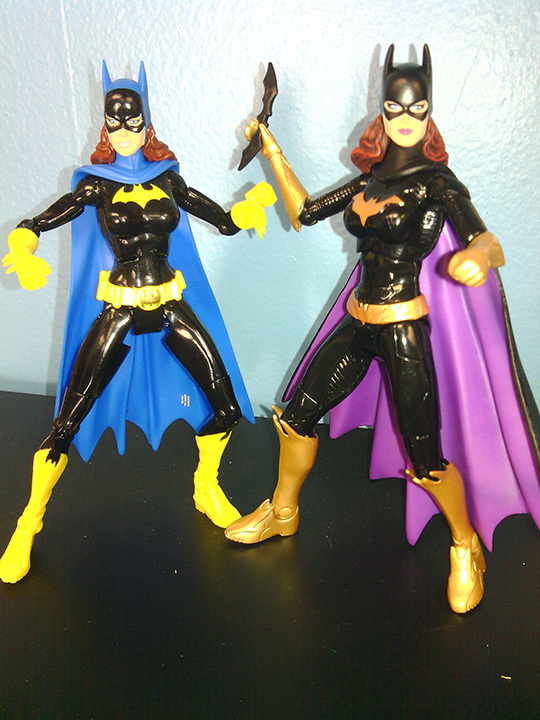 To get around that problem, grab a extra DC Classics display base and take advantage of those peg holes under her feet. I feel like Mattel cut some corners with this figure. A lack of no high bicep & waist swivel and double jointed knees should be a standard Mattel should stick to like with past figures but I guess we can’t have everything. 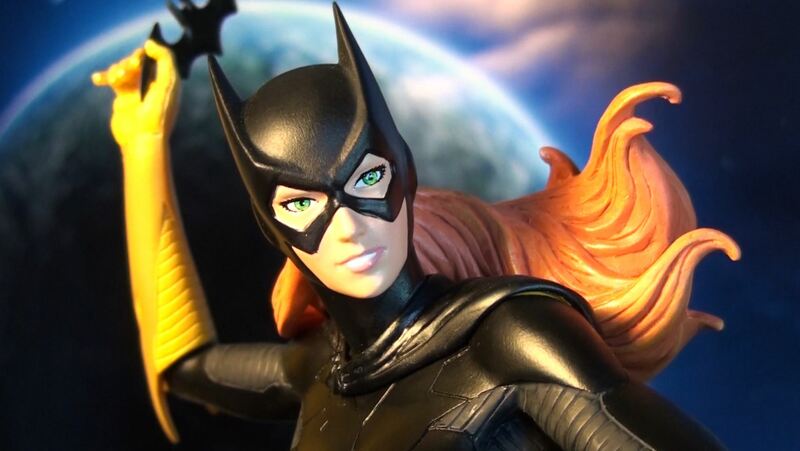 Don’t get me wrong, this without a doubt is the best Batgirl action figure to date…it’s stunning. This will release Fall 2012 at around $16 . 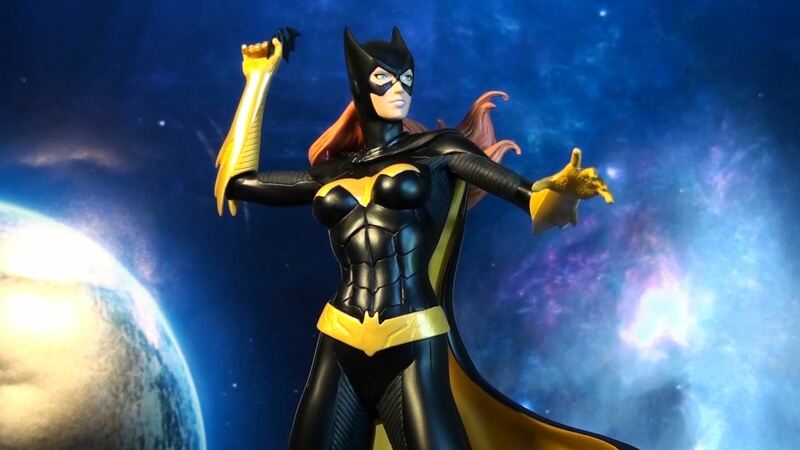 Originally released under Mattel’s DC Superheroes line (before DC Classics), Batgirl returns with all-new paint job in the 2nd series of Batman Legacy Edition Figures. 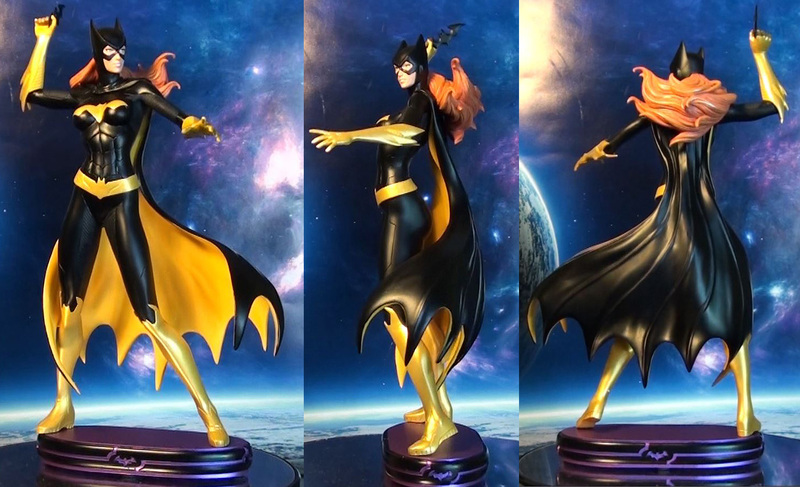 Kotobukiya takes on the DC universe with their first Bishoujo Statue of the classic Barbara Gordon Batgirl. 1/7 Scale, about $70.